Oro Valley - Tucson area attendees will meet at 7:30 AM at the parking lot of the Walmat Store located at 2150 East Tangerine Road. Pay online via credit after registering OR by Cash or Check on the day of the field trip. Non-member RSVP here. Price includes Lunch and snacks. Acknowledgements - The Arizona Geological Society thanks ASARCO LLC for granting us permission to visit their Chilito property and providing geologists to lead the tour. Field Trip Description - AGS Members and their guests are invited to visit Asarco's Chilito porphyry copper deposit in Gila County, Arizona. 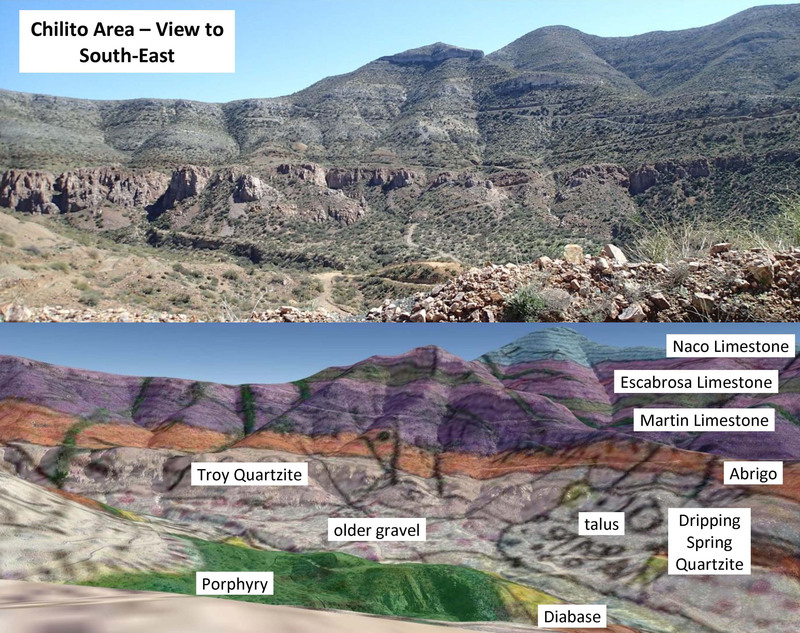 The Chilito deposit is situated in the central Dripping Springs Mountains and is one of the last largely undeveloped deposits remaining in the prolific porphyry copper province of southeastern Arizona. The planned program will include an examination of skeleton core and stops at significant geologic outcrops in the vicinity of the deposit. Tour Date/Time - Saturday. April 22, 2017, 7:30 AM. Carpool Locations - Due to limited space, carpooling is encouraged. The field trip will require 4-wheel drive vehicles, no exceptions. It is encouraged that participants arrange beforehand to share rides with those, who go on the trip with their 4-WD vehicles. Tucson area attendees will assemble at 7:30 AM in Oro Valley at the Walmart parking lot located at 2150 East Tangerine Road, Oro Valley, Az 85737. (Note: please park in the outer areas, not immediately adjacent to Walmart). We will leave parking lot promptly at 7:45 AM, so don't be late. Carpool locations will be established from Phoenix area once participant interest is known. Participant contact information will be sent in advance so carpool arrangements can be made prior to the trip. Route - Tucson based participants will travel north from Oro Valley, along Highway 77, through Oracle Junction and then northeast to Winkleman, Arizona. The approximate travel time is 1 hour 15 minutes. Attendees traveling from outside the Tucson area can join the group at Winkleman Shell Station (located at the junction of Route 77 and Route 177) at 9:00 AM. Group size - Limit 60: Preference will be given to AGS members. A backup list will be maintained in case of cancellations. Please let us know in advance if you need to cancel in order to allow others to participate from the backup list. Once the limit of 60 has been reached, you can sign up on the wait list. Level of Difficulty - The level of difficulty for the trip is normal. Temperature are expected to be in pleasant warm range from 60 to 80 degrees F. Elevation is 1,000 to 1,200 meters (3,000 to 3,500 feet). Bring a light jacket if it is a windy or rainy day. Sunscreen lotion and a good hat to protect the head from too much UV are strongly recommended. Bring sturdy field boots. Eye protection is required, to protect yourself not only from your own hammering away on rocks, but also to shield you from rock chips flying of the adjacent geologist's pick. Hand protection is also encouraged (work gloves). Field Trip Stops - All of the stops except for the last one will be essentially road cuts or places where people only have to walk 50 yards on easy trails. The last stop will be optional and will require a 2/3 mile hike (one way) with change in elevation of approximately 300 feet. It will involve scrambling for more intrepid souls, but also is designed for those who only want to walk a few dozen yards or so. The goal will be outcrops of porphyry with stock work down at the bottom of the canyon, access by walking down (and also back up) on washed out drill roads. This is a bit harder to get to that I don't think everyone will want to do - at the same time there are plenty of things to look at right on the road. This will will be a fairly long stop for those who want to do little scrambling, so at this last point of the trip, so some might just want to hit the road and head home. General Information -The Chilito deposit is a small to medium size porphyry copper deposit located in Gila County, Arizona about 4.5 miles north of Hayden on the southwestern flank of the Dripping Spring Mountains. Primary access to the property is via 4 miles of dirt road that leaves Arizona State Highway 177 about two miles west of Hayden and follows Keystone and Schneider gulches for four more miles to the mine gate. Another dirt road, just west across the wash from the Chilito road, provides access to the 79 Mine, the Overland Mine and the Brick prospects. Miami Copper, Inspiration and Bear Creek explored the Chilito deposit in the 1950s and 1960s. Bear Creek acquired what became roughly two-thirds of the deposit and Inspiration the other third. 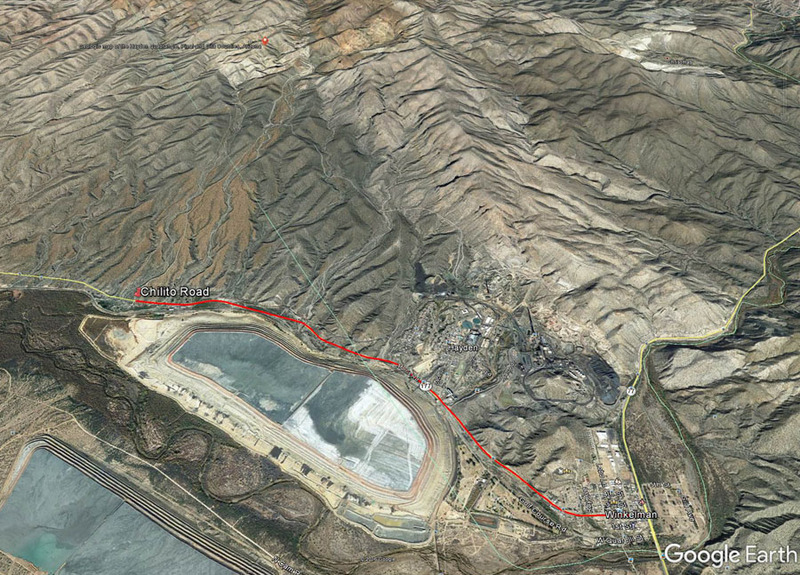 Bear Creek’s portion went to Kennecott, then to ASARCO in 1986 as part of the Ray Mine acquisition. Freeport owned Inspiration’s ground in the southeast sector of the deposit. In 2014 ASARCO purchased Freeport’s other third of the deposit. The deposit is interesting in that two mineralized shells are reported: a shallow shell near the surface and a deeper one, hosted by diabase 1500 feet deep. A reserve study, done by ASARCO in 1990 and restricted to the upper shell, indicated a sulfide resource of 85.7 million tons with a cutoff grade of 0.30% Cu and a 1.52:1 stripping ratio. Various other estimates have been made by Kennecott including both sulfide and leachable resources but the data for these estimates are considered to be questionable (see the reports by Borrok, Johns and Graybeal). This was based on only fifty-six holes that been drilled in the deposit up to that point, with questionable recoveries, and there appears to be good potential for increasing both the grade and size of the reserve within the property as it now exists plus excellent potential for the discovery of new deposits in adjacent areas, especially to the west-southwest toward the 79 Mine and Overland Mines. Following the completion of a four year drilling program in 2011, Independent Mining Consultants prepared a new ore reserve model during 2013. This model included the upper zone and just barely reaches the upper limit of the deeper zone. The bottom of the block model has an elevation of 610 meters (2,001 feet). This study places the Chilito ore reserves at approximately 96 million tonnes containing 0.462% Cu at a cut-off grade of 0.27% TCu. The Chilito deposit lies between the Ray Mine to the northwest and the Christmas Mine to the southeast along an extensive northwest trending structural zone that extends all the way to Superior. Numerous small lead-zinc-copper-gold-silver mines and prospects occur along this trend. Borrok, David (Sept., 1999): Review of the Chilito porphyry copper prospect; unpublished company report, ASARCO Incorporated, 13 pages. Eastlick, J.T. (1968): Geology of the Christmas mine and vicinity, Banner Mining District, Arizona in Ridge, J. D., ed. Ore Deposits of the United States, 1933- 1967; New York, Am. Inst. Mining, Metall., and Petrol. Eng., p1191-1210. Einaudi, Marco (1982): Description of skarns associated with porphyry copper plutons, southwestern North America in Advances in geology of the porphyry copper deposits, southwestern North America; Titley, S. R., Editor; University of Arizona Press, Tucson, Arizona, pages 139-183. Graybeal, Fred, (undated): Chilito Porphyry Copper Deposit, Gila County, AZ: unpublished company memorandum, ASARCO Incorporated, 1 page. Keith, Stanley B. (1972): Mineralogy and paragenesis of the 79 Mine lead-zinc-copper deposit; Mineralogical Record, Nov.-Dec., 1972, pages 247-264. Kiersch, George A. (1949): Structural control and mineralization at the Seventy-nine Mine, Gila County, Arizona; Economic Geology V. 44, pages 24-39. Koski, R. and Cook, D. (1982): Geology of the Christmas porphyry copper deposit, Gila County, Arizona in Advances in geology of the porphyry copper deposits, southwestern North America; Titley, S. R., Editor; University of Arizona Press, Tucson, Arizona, pages 353 – 373. McClave, M. (2007): Geology of the Chilito Mine, unpublished company report, ASARCO LLC, 15 pages. Taylor, S.A. and Babcock, R.C. (1963): Chilito Examination Progress Map; unpublished company map, Bear Creek Mining Company. Contact Info - If you have additional questions about the Spring Field Trip contact Don Applebee at (520) 247-8577 or dapplebee@asarco.com.